The Malatya Provincial Directorate of Culture and Tourism has stated its relief about the discovery of an artifact depicting Hittite King Maradas on a chariot hunting a deer on display in the Louvre Museum of France, after it was unearthed at Aslantepe Mound, which is on the UNESCO Tentative List of Cultural World Heritage, in 1891. Efforts started for the return of the historical artifact, which was mentioned on state-run TV channel TRT in a documentary on Malatya in 1986, to Turkey. Malatya is a province that reflects the rich historical culture of Anatolia and has witnessed the establishment of many city-states throughout the centuries. Aslantepe Mound has brought to light much of the rich history, with finds including a palace ornamented with colorful figures on the walls, a 5,500-year-old temple and swords and spears. On the western shore of the Euphrates River and 7 kilometers away from Malatya province, the Aslantepe Mound has been embraced by civilizations for millennia thanks to its high agricultural potential, wetland areas and protected structure from the river overflows. Housing the ruins of periods from the Late Chalcolithic Age of the 5000s B.C. to the Iron Age, the Aslantepe Mound bears the traces of many civilizations such as the Hittites, Romans and Byzantines. The mound of the Late Hittite period reveals structures from the first city-state with an adobe palace with a substructure of a rainwater drainage system with more than 2,000 seals. Aslantepe has colorful figures depicting its power on its walls and reveals the early state system on its engraved relief plates. There are many works that have been unearthed and have similarities with Mesopotamian cultures such as bowls and pots. Speaking to Anadolu Agency (AA), the Provincial Director of Culture and Tourism Levent İskenderoğlu said that the first city-state in Anatolia along with the oldest palace in the world were found here. Noting Aslantepe Mound is one of the most important archaeological centers in Anatolia, İskenderoğlu said, "The reason why this place is believed to be the first city-state in Anatolia is the seals. These seals are an indicator of the rising bureaucracy since every seal belongs to a state official. Nearly 2,200 seals have been unearthed so far. This shows the city's needs were stored here and they were handed out by officials to the public. For this reason, we call it the first city-state and the first bureaucracy in Anatolia." İskenderoğlu expressed that a team of French archaeologists came to Malatya province in the 1890s and started excavation works in 1932. He continued, "An Italian group took over the works in 1961. An academic at La Sapienza University in Rome, Professor Marcella Frangipane is still continuing work here. "İskenderoğlu added that the Hittite works that were unearthed in the mound in the 1930s were taken to the Anatolian Civilizations Museum and many of them are on display in the Malatya Archaeological Museum. "While we were searching the archives, we discovered a TRT documentary about Malatya in 1986 that there were artifacts found here in 1891 and it was taken to the Louvre Museum in France. This was known in the 1980s and was mentioned in this documentary but it was forgotten later. We informed this finding to Malatya Governor Ali Kaban. The governor wanted us to search for it. We prepared a detailed file. Then, we conveyed our request to the General Directorate of Cultural Heritage and Museums of the Ministry of Culture and Tourism with the signature of the governor. I hope this artifact will return to the place where it was unearthed," İskenderoğlu said. Giving information about the relief of the "Deer Hunt" artifact, İskenderoğlu said, "This relief dates back to the Late Hittite period. There are 'Luvian' writings on it. In the relief, Hittite King Maradas is on his chariot hunting a deer. It is really interesting. It was described in a TRT documentary that Aslantepe was famous for this artifact. We have another similar relief here. However, there is a lion instead of a deer on it. 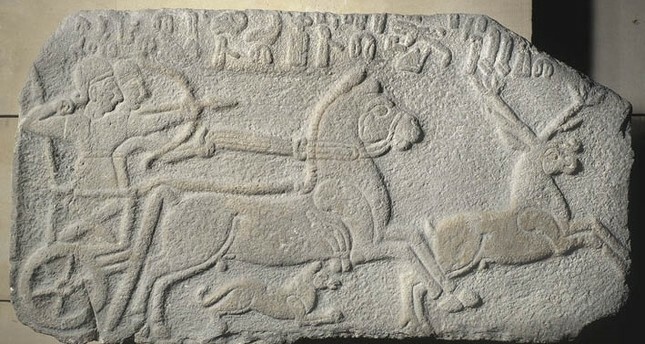 This work is on display at the Anatolia Civilizations Museum, which shows the relief of 'Deer Hunt' also belongs here. In recent years, many artifacts have returned to Turkey. We will be satisfied if we take this one back, too."